This article contains 50 fast facts and information about the Mayflower ship that, in 1620, transported 102 English passengers from a site near the Mayflower Steps in Plymouth, England to Massachusetts in America which would become the capital of Plymouth Colony. The Mayflower ship fact files provides fast access to facts and stats on the design of the ship together with a description of the different parts of the ship. The facts about the Mayflower ship also provides interesting information about the living conditions of the passengers and crew. The following facts about the Mayflower Ship provide interesting facts and an overview and description of the vessel and the living conditions of the passengers. Mayflower Ship Fact 3 The owner of the Mayflower was Christopher Jones who was also the captain of the ship. 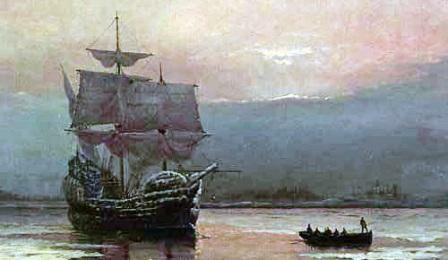 Mayflower Ship Fact 6 The Mayflower was a sailing ship that was propelled by the wind. Mayflower Ship Fact 7 Vessel Description: The Mayflower was a type of ship called a carrack. The carrack design of ship had three masts, square-rigged on the foremast and mainmast. Carracks were ocean going ships that were large enough to be stable in heavy seas such as the Atlantic and roomy enough to carry provisions for long voyages in the cargo holds. Mayflower Ship Fact 19 The passengers lived on the "Tween Deck" which was about 80 foot long and at its largest point was 24 feet wide. The Gun Deck, or "Tween Deck", had a separate 12 foot gun room. This reduced the living accommodation to just 68 feet. Mayflower Ship Fact 20 There were three masts called the mizzen mast, the Main mast and the Fore mast. A mast was a tall, slim pole, usually tapering upward, used to support the sails on a ship. There was also a moveable Spritsail. Mayflower Ship Fact 24 The Upper deck: The captain lived at one end of the upper deck in the poop house and the crew had their living quarters at the other end of the upper deck. Mayflower Ship Fact 36 The Cargo hold was also used to store possessions of the passengers. Each family was allowed one box for their possessions. Mayflower Ship Fact 40 The binnacle was a fixed box that stood directly in front of the wheel. The compass was placed inside the binnacle. It was completely covered in, having a glass window, through which the man at the wheel could observe the course he was steering. Mayflower Ship Fact 41 The navigational instruments, equipment and devices used by the seamen on the Mayflower included the compass, the astrolabe, the Cross staff, the Quadrant, the Chipboard and the Hourglass. Mayflower Ship Fact 43 The Compass was used to determine direction and chart the course. The compass was kept in the binnacle. 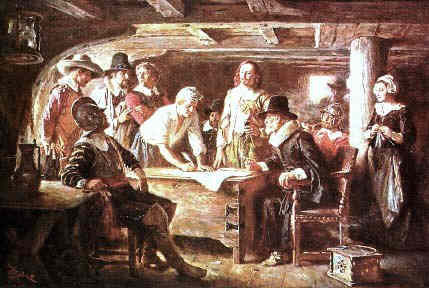 Mayflower Ship Fact 48 The captain was in charge of the ship and all of his orders had to be obeyed. The 50 facts about the Mayflower ship is a fast and accurate way to gain a good understanding of the the layout of the ship and the names of different parts of the ship. The information also provides and understanding of the limited help that was available to the seamen and sailors who guided the Mayflower in the 3000 mile trip across the Atlantic Ocean. The facts and stats about the size of the vessel provides an insight into the living conditions experienced by the passengers on the ship and their brave decision to travel so far, to unknown shores, to explore the opportunities that America had to offer.